Imagine a cold glass of water sitting outside on a hot summer day. Condensation forms on the outside of the glass, where the cold glass is coming into contact with the warm, humid air. The same thing may be happening on the inside of your attic; the warm, moist air trapped inside of your home is coming into contact with the cold wooden surfaces in your attic, forming large damaging water droplets. These water droplets can lead to lots of problems for you as a home owner, namely rot, mold, and leaks. 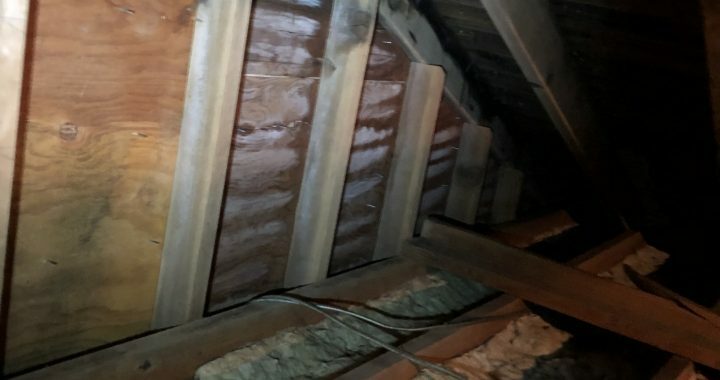 It is important to note that this is not a roof-related issue; heat and humidity originating from the interior environment of the home and traveling up into the attic on the underside of the roof is the cause of attic condensation. There are plenty of things you can do to minimize attic condensation from occurring. Good insulation is a must because it minimizes the amount of warm air entering the attic to begin with. 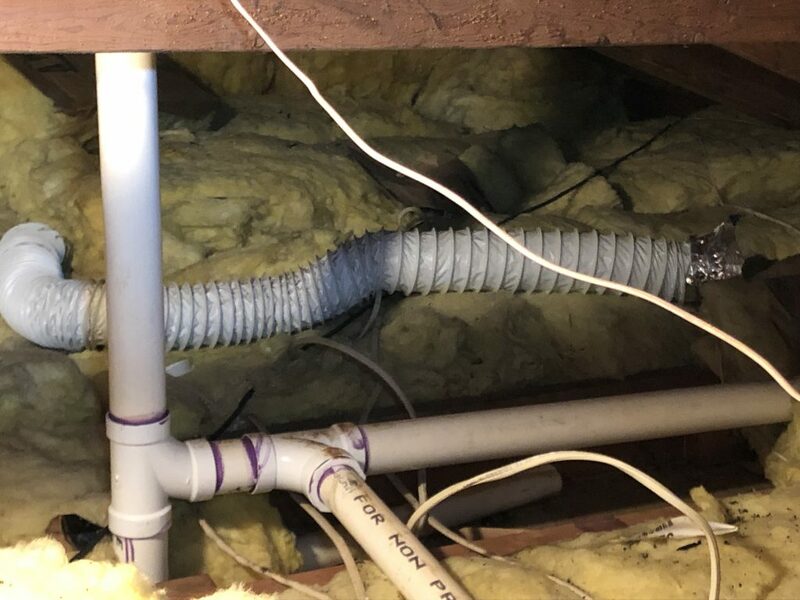 This is especially important in your attic bypasses – areas connecting to your home, like heating ducts, kitchen exhaust fans, lighting fixtures, bathroom vents, etc. – make sure they are properly insulated. Also, installing a whole-home dehumidifier may counteract the buildup of moisture. What makes attic condensation so insidious is that it is much harder to spot and address. 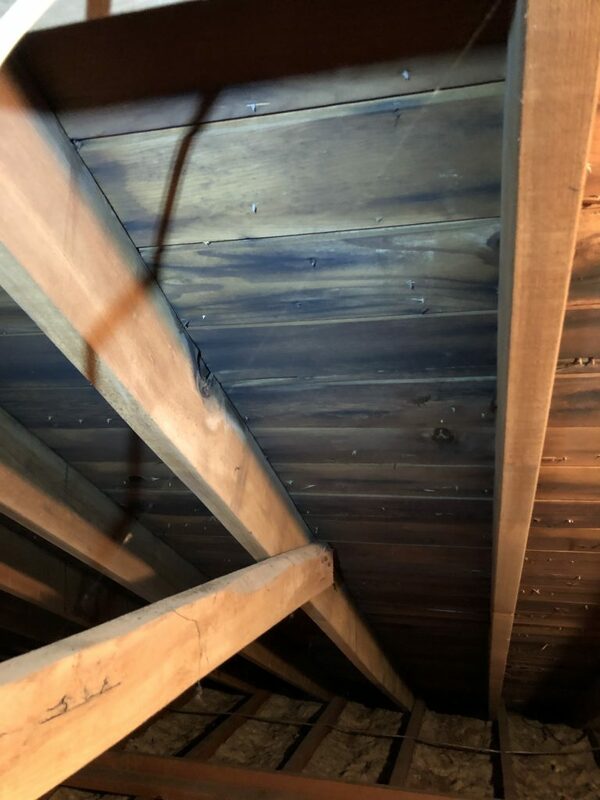 It is possible to go unnoticed until your roof starts sagging from the rotting of the beams in your attic, or until you start having respiratory issues from the buildup of mold. These issues require major repair, and the hiring of specialized mold remediation crews; all of which can be prevented by properly insulating your attic, which is much cheaper in the long run. Check areas around pipes running through your attic space. They are prone to building up condensation. Also, attic condensation isn’t a problem limited to only older homes; newer homes can be affected as well. Most building codes don’t address humidity issues, and are also pretty lax on the level of insulation required in your attic, especially around those previously mentioned attic bypasses. A-Top Roofing and Construction has decades of experience and professionally trained crews to help minimize the buildup of attic condensation. There are many procedures to address condensation forming in your attic, but they all have the same goal: keeping heat in the interior living space of your home. Our crew will start by adding additional insulation into your attic to prevent heat from migrating from below; areas such as lighting fixtures, ceiling fans, and attic stair pull-downs will be surrounded with insulation to prevent hot air from entering your attic. Additionally, our crews can install ventilation intakes on your soffit eves, additional attic fans controlled by a humistat, and a humidifier on your furnace so you can monitor the outside weather conditions and adjust accordingly. All of these services will help decrease the amount of humidity in your attic, thus decreasing the buildup of attic condensation. By performing these suggested procedures you can minimize the effects of this winter time condition. Keep A-Top Roofing and Construction in mind for all of your roofing repair and replacement needs. We have over 30 years experience and service all parts of Central New Jersey. Our services include: residential and commercial roofing, gutters, skylights, flat and metal roofs, vinyl siding, soffits, facia, replacement doors and windows, decks, porches, columns and mold remediation. Feel free to give us a call at (732) 446-6341 or find more information about our services on our website: https://a-topconstruction.com.